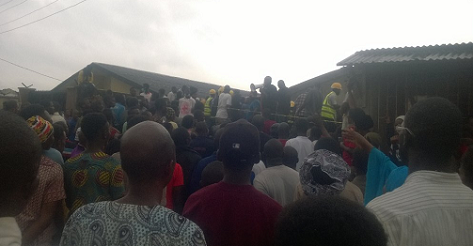 A baby died this morning when a storey building collapsed at Seidu Okeleji street, Meiran, Lagos. Unfortunately, all the occupants of the house were at home due to the election restriction of movement. The incident happened during the heavy downpour of this morning. Officials of the Lagos State Emergency Management Agency, LASEMA, and others have been on ground to rescue trapped people. The place has also been condoned off. The baby was initially rescued alive, but died shortly after due to injuries sustained. this is rubbish, as long as the man wasn't forced to do it, i thought we have grown past this traditional stupidity era?